KNYSNA NEWS - At 11:30 on Saturday, 26th January, NSRI Station 12 Knysna duty crew were activated following a request for assistance from an NSRI crewman skippering his yacht that was taking water near to the Knysna Heads. According to a press release from Jerome Simonis, NSRI Knysna station commander, while entering Knysna Heads from a morning cruise with 5 crew, 4 males and a female, and while raising the mainsail a gust of wind caught the sail and pushed the yacht bow onto Monkey Point where the yacht was holed and taking water fast. 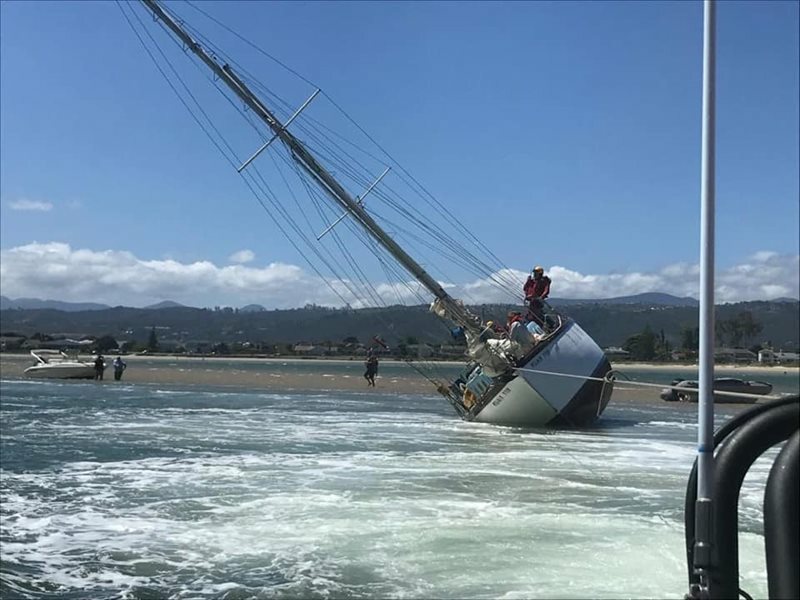 “Plywood and glue sealer were used to patch 2 holes in the hull and water pumped out for 3 hours and once the water was pumped out of the yacht, and temporary seals were holding fast, we were able to pull the yacht free from Pansy Shell Bank and we towed the yacht to her mooring where further repair efforts will continue,” reads the statement.